Focus E15 campaign - Focus on the Future - made a bold statement on the Carpenters' Estate on Monday 9 June in East London to highlight and challenge Newham Labour Council's policy of expelling the poor and vulnerable out of London to towns and cities hundreds of miles away, claiming there is no housing in Newham. Thousands of properties are empty and boarded up in Newham and not least is the example of the Carpenters Estate. THE CHAIRMAN of a hospital under threat of cuts and privatisation stormed out of a public meeting on Wednesday after being presented with more than 5,000 signatures from campaigners opposed to the Board's plans. Steve Hitchins, who is Chair of the Whittington Hospital Trust Board, refused to answer questions about why the hospital is being privatised and why A&E services are now under review. Instead he instructed his colleagues on the Management Board to leave the room. For more than a year, North London RCG have been maintaining weekly street stalls in opposition to the privatisation agenda being pushed through by the management board of Whittington Hospital in Archway. The response clearly shows the anger in the local community. Hundreds of people stop to sign and talk each week and a group of regular supporters have joined in our protests. On 19 April we took a banner to the hospital made up of hundreds of handwritten messages from local residents demanding the Whittington Hospital is kept as a local general hospital and not turned into a Foundation Trust. On 15 June comrades and supporters of the Revolutionary Communist Group took to Oxford Street in central London to show solidarity with Palestine on the day Palestinians refer to as the Nakba (the Disaster). The Nakba commemorates the period in 1948 when over 700,000 Palestinians had to flee their homes, or were physically removed, during the vicious war on Palestinian people by the newly-founded Israeli state. During this period Israel took vast swathes of the Palestinian territory and no Arab-Palestinian state was created. The protest took place outside Marks and Spencer as it is a British high street business that has vast trade links with Israel. The campaign Victory to the Intifada continues to take an active part in the Boycott Divestment and Sanctions street movement to put pressure on the British state to cease financial support with racist and apartheid Israel. Since early 2012, North London RCG has held regular stalls in Holloway, North London, petitioning against attempts to turn the local Whittington Hospital into a Foundation Trust, a further step towards privatisation.The Hospital Management's plans have included severe cuts to staff and facilities. Thousands of people have stopped to sign and show their support. With the Hospital's future more uncertain than ever, we continue to hold weekend stalls in Holloway and Archway. Join us to demand a state-funded, local hospital that meets people's needs. Don't just get angry, get active! February has been a busy month for the Focus E15 Campaign, with organised and lively events stepping up the pressure on Newham's Labour council, and building the campaign. Lets hope March will be an even busier month, pushing the message - social housing, not social cleansing! On Friday 21 February, the Focus E15 campaign held their 'Focus Fun Bus Big Day Out'. Focus E15 mothers and their supporters, including FRFI/RCG, and friends took thousands of signed petitions to hand in to Boris Johnson, mayor of London, at City Hall. Travelling on a decorated open top bus, the campaign was heard loud and clear as the bus went from Stratford, east London, to the embankment near Tower Bridge, singing and chanting 'social housing, not social cleansing', demanding the basic right of secure social housing, not insecure private-sector rented accommodation. Fight Racism! Fight Imperialism! Joined the London National protest against Atos called by Black Triangle, Disabled People against Cuts and others outside Atos head office. A lot of new jargon is necessary to understand what is happening to benefits cuts at this time. But the strong message of the protest was that we had all better understand because any one of us could end up unable to work for the long or short term because of an accident, the onset of mental illness, disability or disease. The £500 million contract from the Department for Work and Pensions (DWP) with the multi national company Atos Healthcare was set up in 2010 with the aim of testing all 1.5 million people on sickness benefits in the UK. The Work Capacity Assessment (WCA) is a computer-led points-based assessment by often medically non-qualified Atos staff to determine whether to move people from Disability Benefits (DI) and put them on Job Seekers Allowance (JSA) or Employment Support Allowance (ESA). The Focus E15 campaign has now been fighting for social housing in East London for over six months. The Newham Labour council has responded with lies and spin, attempting to cover up their attacks on the working class, and their absolute complicity with the project of cuts and austerity. Below we republish, with permission, an exchange from the Focus E15 Mothers Campaign Facebook page. Daniella, a supporter of the campaign had written to councillor Ellie Robinson, the executive member for Safeguarding and Community Affairs, and received the predictable slippery reponse. Below this Jasmin Stone, one of the mothers leading the campaign, explains the reality of the behaviour of Newham council and the East Thames housing association. FRFI/RCG continues to support and organise with the Focus E15 Campaign. Social housing not social cleansing! On Friday 17 January, Focus E15 mothers, their babies and supporters of the campaign held a tea party in the showflat in the East Thames Housing Association offices, with decorations, party poppers, balloons - the children had fun, the mothers were happy and the message was clear - secure social housing in London. East Thames is the landlord of Focus E15 hostel, where the young mothers and babies who are on the homeless list of Newham Council, have been temporarily housed. The young mothers have been offered properties as far away as Hastings and Birmingham, in the private-rented sector, while East Thames has thousands of properties in East London and Essex, and Newham Council has boarded up properties in Stratford such as the Carpenters Estate. Members of the Revolutionary Communist Group (RCG) joined 200+ protesters, including students, teachers, campaigns and people from the community assembled outside Lambeth Town Hall last night to tell the council they are against the bedroom tax, benefits cuts and the sell-off of Lambeth College. 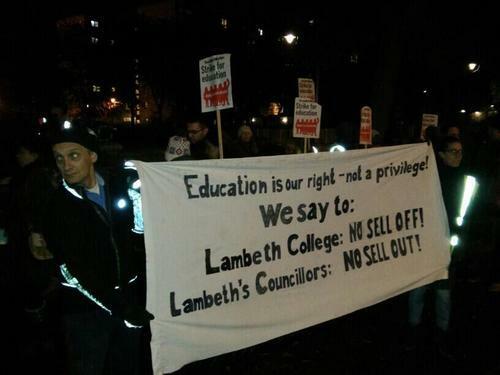 Earlier that evening 60+ students, teachers and activists assembled outside Lambeth College on Brixton Hill to oppose the sell-off of the site to private developers. Campaigners are demanding the principal Mark Silvermann recognises the groups demands, which also cover issues such as expensive canteens and lack of childcare. Members of the South London RCG with their big sound system joined protesters from the Save Brixton College campaign to take to the roads for a march down Brixton hill and around the Brixton market area. People joined on the way for chants and speeches on the microphone, explaining how the council is doing nothing to stop the sell-off of the college. Focus E15 mothers: One step forward! On Saturday 16 November, Focus E15 mothers, their babies together with FRFI and other supporters were out in force on the streets of Stratford. A significant victory has just been achieved. The mothers have received a letter from East Thames, the housing association that runs Focus E15 hostel, saying that the support that was removed in September has been reinstated. This means that the council has had to backtrack on its decision to remove the £41,000 Supporting People funding stream to the mother and baby unit. Supporters of Fight Racism! Fight Imperialism! and Victory to the Intifada held their monthly demonstration outside Marks and Spencer in Oxford Street in London on Thursday 3 October. On Thursday 10 October a lively event of 80+ people took place on the campus at the School of Oriental and African Studies (SOAS) in London to discuss the Walter Rodney book, How Europe Underdeveloped Africa. On Saturday 12 October, Fight Racism! Fight Imperialism! with Focus E15 Mothers and friends, family and supporters came together at Ithaca House in Stratford, E15. It was the first public meeting of the campaign, to update everyone about the campaign so far and plan ahead. Young mothers and mothers-to-be from Focus E15 mother and baby unit are taking action because the unit has lost £41,000 of council funding from the council and faces closure. They have been warned to start looking for accommodation and some of them have been served with eviction notices from East Thames Housing Association, which administers Focus E15. Support the Focus E15 Mothers! On Saturday 5 October, the Focus E15 Mothers campaign held a lively rally on the streets of Stratford, East London. Mums, children and supporters made speeches, petitioned and publicised the campaign, encouraging local people to attend a public meeting this Saturday (see details below). The Focus E15 Mothers are a group of young mothers and mothers-to-be facing eviction from their homes at the FocusE15 centre, a hostel for young people in Stratford that includes a mother and baby unit. On Saturday 7 September, 5,000 people assembled at Altab-Ali Park, named in honour of a young Bangladeshi textile worker murdered by fascists in 1978, in an attempt to stop the fascist English Defence League from marching through Tower Hamlets, East London, an area with a large Asian population. An FRFI supporter who was at the demonstration reports. The Counihan-Sanchez family from Kilburn are continuing to resist attempts by Brent Labour council to make them homeless. The Counihan-Sanchez Housing Campaign (CSHC) are supporting the family and continuing to fight all evictions and cuts in Brent. The family of seven were made homeless by Brent after they declared £18 a week income from a plot of land in Ireland. Since April 2012, the family have been in shoddy accommodation in Ealing which costs Brent council £500 per week. UEFA out of Israel! Israel out of Palestine! FRFI activists in London and Manchester are participating in the international campaign to demand that UEFA pull its Under-21s final football tournament out of Israel, where it is due to be held from 5 to 18 June 2013. In London, on 24 May, activists assembled outside St Pancras Inter­national station to receive around 40 activists from several European countries, mainly France, who arrived to cheers and chants of Free Palestine! Boycott Israel! We then set off for a 250-strong march to Grosvenor Hotel in Park Lane where the UEFA annual congress was taking place. FRFI was among the coalition of groups which organised the day of action, along with Football Beyond Borders and Red Card Israeli Racism – which held a five-hour rally outside the hotel. A small group of intrepid activists even managed, later, to get past security and protest at the UEFA dinner itself. In front of guests including David Beckham and Alex Ferguson, one got onto the platform to denounce Israel and another stood behind UEFA president Michel Platini holding a flag. Around 1000 - 2000 people marched from Waterloo to the Department of Health on Whitehall, to protest against ongoing cuts and the privatisation of the NHS. The march was backed by 10 London Save our Hospitals Campaigns, including 5 Labour MPs, 3 London Trades Councils and local branches of GMB, NUJ. Unison, and UNITE. Defend Whittington Hospital! We want our NHS back! 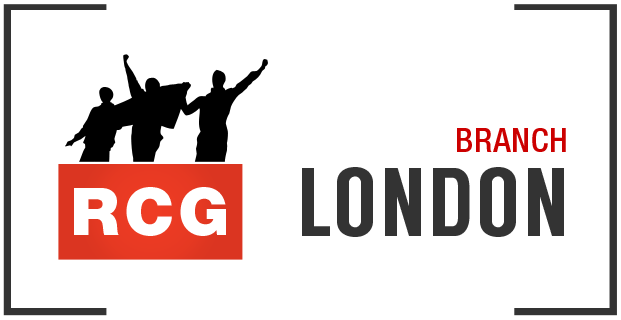 16 March 2013 – RCG supporters joined up to 5,000 people marching against the proposed sell off at Whittington Hospital in Archway, North London. The march started at Highbury corner and closed-off the busy Holloway Road as it made its way up to the hospital at Archway. Lewisham Hospital is being sacrificed to parasites. The government’s plans to remove its Accident and Emergency service, maternity wards, paediatric and other services in order to provide private companies with extraordinary profits, which furnish the pleasures of multi-millionaires. The South London Health Care Trust (SLHT) has run up a deficit of £15 million over the past 3 years. In 2012 the cost of servicing its debt is estimated to have been £61m – nearly 15% of its income. The SLHT total debt burden exceeds £2bn. Five hundred people attended a Stop the Sell-off meeting chaired by Jeremy Corbyn MP on Tuesday 12 February at Archway Methodist Church in Islington called by the Defend Whittington Hospital Campaign. Two weeks ago the Whittington Management Board announced that buildings would be sold, staff accommodation demolished, 570 jobs in nursing and administration would go, beds to be reduced from 330 to 177 and birth services to be capped at 4,000 per year. On Saturday 26 January 25,000 people march through Lewisham, south east London, in a show of strength against plans to close Lewisham Hospital. No provision has been made for the 30,000 emergency admissions and complex cases every year that would need to go out of area if this hospital is lost. Queen Elizabeth Hospital Woolwich (QEH), already struggling, would become responsible for providing A&E services to 750,000 people from Lewisham. QEH and Princess Royal Hospital Orpington are being bankrupted by unaffordable Private Finance Initiative schemes - £250 million that will be £2.5 billion when repaid. Matthew Kershaw, who has been appointed as a special administrator, has decided to axe Lewisham Hospital, a thriving busy hospital in a neighbouring borough. This is no solution. The Counihan-Sanchez Housing Campaign (CSHC) plans to broaden our campaign for housing for the Counihan family and against cuts and evictions in Brent in 2013. In November 2012 we won our first victory in our battle with Brent Labour council, who have been forced to reinstate the Housing Benefit which Brent withdrew from the family when they declared them ‘intentionally homeless’ in April 2012. Housing for the Counihans! Housing for all! No cuts in Brent! No cuts at all! On Saturday 1 December, the Counihan Sanchez Family campaign had its second successful march through Kilburn, north London. The march resonated with working class people on the streets, who are all too aware of the savage council cuts. The family campaign banner led the march, followed by banners from Fight Racism! Fight Imperialism!, the Trade Unionist and Socialist Coalition, the Kilburn Unemployed Workers Group and the Labour Representation Committee. The march was loud and vocal to the end, with speeches, chanting, singing and poetry. Sarah Counihan-Sanchez aged 15 told a packed public meeting at the Marian Centre in Kilburn on 17October how her family had received a third eviction order from Brent Council and have been ordered to quit their temporary accommodation by 8 November. The family were evicted by Brent Council in April 2012 18 months after they declared £18 a week income from a small plot of land they had inherited in Ireland. On Saturday 30 June, Fight Racism! Fight Imperialism! supported a successful demonstration called by the Hands Off Somalia campaign (HOS) outside the BBC in Portland Place London. The demonstration was called in response to the biased and selective coverage of Somalia, and in particular to the use of documentaries such as Escape from the world’s most dangerous place to build up propaganda in favour of imperialist intervention, both military and otherwise, to ‘save’ Somalia from itself. On 16 June 2012, Fight Racism! Fight Imperialism! spoke alongside other groups at a public meeting of the Hands off Somalia campaign, entitled Imperialist Hands off Africa, in Shepherds Bush. The conference meeting was organised by HOS to bring awareness and action around the new scramble for Africa which is being lead by the British government and its imperialist allies. The other groups speaking on the platform were Uhuru, Pan Afrikan Women's Association (Moyo-Wa-Taifa), Supporters packed the meeting at the Horn of Africa Community Centre to discuss the legacy and impact colonialism has left on Africa as well as the alternative and ways to oppose British imperialism.